Hey all! Happy Tuesday! I'm so glad you could stop by. I had a pretty productive weekend creating and today, I want to share with you this adorable card. Yes, I know, I really am addicted to this bundle of product. I just keep reaching for it over and over again. 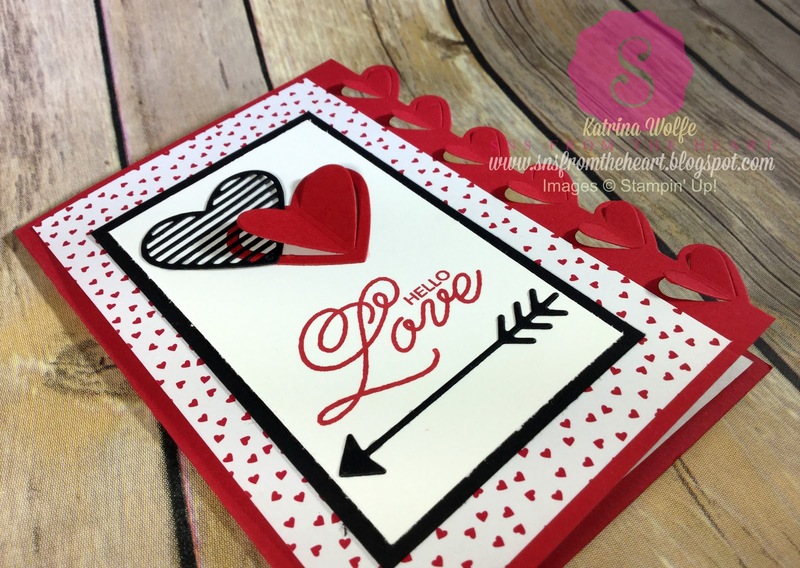 Yes, I really do love all the other things in this Occasions catalog, but right now, with Valentines Day right around the corner, it seems to be drawing me to this set time and time again. 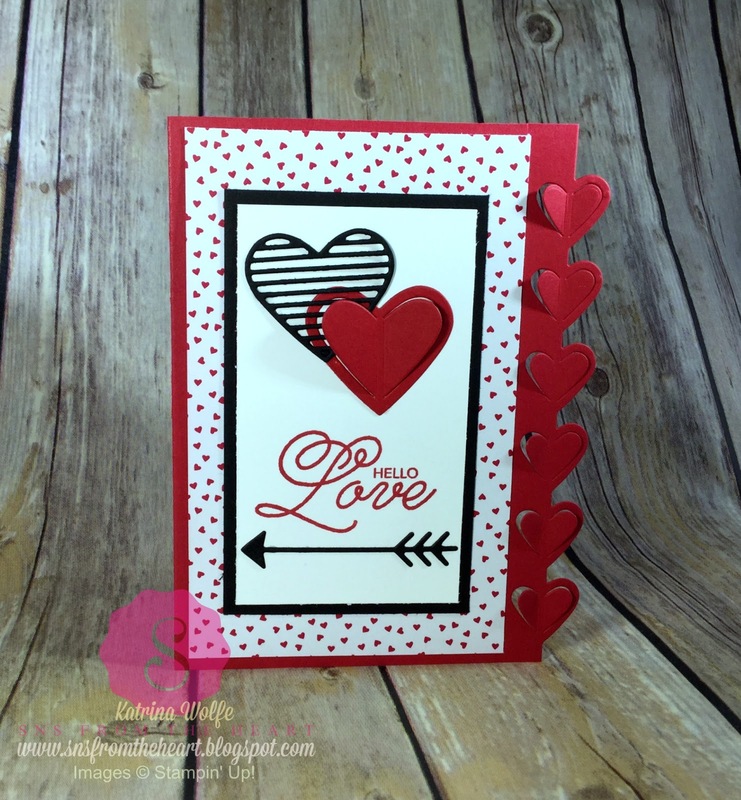 The coordinating dies make this card SOOOO easy! I hope you enjoy this one as much as I do. Paper: Real Red 8 1/2" x 5 1/2" scored and folded at 4 1/4", scrap piece for the dimensional heart; Sending Love DSP 5 1/4" x 3 1/4"; Basic Black 2 1/2" x 4 1/4", scrap for the die cut heart and arrow; Whisper White 2 1/4" x 4"
Run the Real Red Card base through the Big Shot with the Heart Border die from the collection, add dimension by pulling the heart edges upward. Then adhere the DSP with Fast Fuse to the center of the card base just to the left of the dimensional hearts. Run scraps of Real Red and Basic Black through the Big Shot with the heart dies and arrow die. Adhere the hearts using the Fine Tip glue, overlapping the 2. Stamp the sentiment in Real Red and adhere the arrow below the sentiment also using the Fine Tip glue. Layer this onto the Basic Black panel and adhere this entire piece to the center of the card base using Fast Fuse. That's it! Like I said, EASY PEASY! So, what do you think? Please feel free to leave a comment. As always, I love to hear your thoughts.